Aval Kesari| Poha kesari| Poha Sheera is a yummy alternative to the regular Rava kesari. I have already shared pineapple kesari, Milk kesari and Semiya kesari recipe in blog. This recipe i have prepared for Vinayaka chaturthi and was not able post. Today i some how managed to post this yummy kesari recipe. 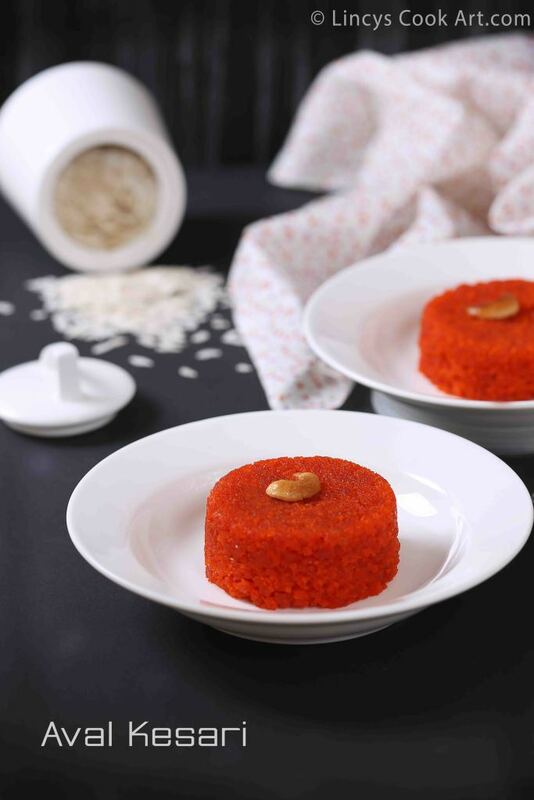 This tastes similar to rava kesari, it suits perfect for Navaratri or Vinayaka chaturthi which occasions lots a of aval recipes been prepared. This kesari requires less ghee when compare to the normal kesari so i feel guilt free when i consume this yummy dessert. Using a blender jar powder the aval like fine rava. In a pan heat a tablespoon of ghee and roast the cashew and raisins. Once they become golden remove from the pan and add the powdered aval on to the hot ghee and fry till nice aroma arises. In a boil 2 cups of water till rolling hot and add the food colour. Now add the roasted rava powder and mix well. Cook till the water almost evaporates. Now add the sugar and allow to cook. Once the sugar dissolved completely add ghee little by little till the kesari comes together as a whole mass with out sticking to the pan. Now add the cardamom powder and cook for a minute. Now add the roasted cashews and raisins and switch off the flame. Grease a bowl and keep the kesari while it is hot. You could grease a pan and fill the kesari and cut into pieces and serve. I tried this recipe. It turned out nice. Thanks Lincy for the recipe.